The Largest Toenail Fungus Treatment Center in the U.S.
Toenail Fungus treatment using our FDA cleared Foot Laser is the most effective way to cure toenail fungus. 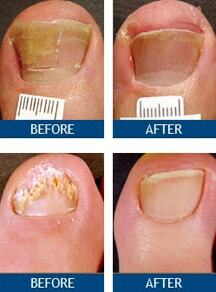 Laser Nail Therapy Clinics specialize exclusively in toenail fungus treatment. Our experienced nail doctors have successfully treated thousands of toenail fungus patients using the FDA cleared PinPointe FootLaser. PinPointe FootLaser Featured on CBS "The Doctors"
Toenail Fungus infections are unsightly and embarrassing – the infected nail becomes yellow, thick and hard to cut. Although toe nail fungus infections are also very common, they can be very difficult to treat. Until recently, the most common treatment for toenail fungus was taking pills that might cause liver toxicity. But several years of research gave birth to a much safer solution: The PinPointe Foot Laser. This safe, quick and painless laser treatment has proven to be a very effective cure for toenail fungus and fingernail fungus infection. Getting rid of toenail fungus will give you the confidence to expose your feet again. Our clinics offer unmatched expertise curing toenail fungus, since our nail doctors focus exclusively on toenail fungus removal. We proudly serve Los Angeles, New York City, Dallas, Houston, Boston, Phoenix and over 50 other cities. The toenail doctors of Laser Nail Therapy offer state-of-the-art toenail fungus laser treatment, combined with first rate patient care. Most of our locations are open 7 days a week from 9am to 9pm. Pinpointe Foot Laser toenail fungus treatment is a major breakthrough, bringing new hope to millions of patients. Our experienced foot doctors have successfully treated tens of thousands of patients with toenail fungus, in over 50 locations across the U.S. and Canada. Contact us if you would like to hear how our foot doctors can help treat your toenail fungus. Click here to learn about Nail Fungus Treatment Options. Nail fungus is a fungal infection of the nail and nail bed. This should be differentiated from athlete’s foot in which the fungus infects the skin of the feet. About half of the fungal infections occur as a result of nail disorders. Therefore, the infection is much more common under sick or deformed toenails. Nail infection is usually very persistent and requires complicated treatment to restore the clear nail. In addition, Toenail Fungus Infections may cause embarrassment because of the deformed nails. Toenail Fungus signs include a thickened nail plate or nail bed, yellow discoloration of the nails, foot pain and bad foot odor. The nails often become thick and fragile and can detach from the nail bed. Nail fungus usually starts at the distal end of the fingernail or toenail. The infection then spreads to the proximal end of the nail towards the nail bed. Finally, the fungal infection spreads to other toenails, but rarely infects all of them. Candida and Dermatophytes are the most common fungi causing nail infections. But mostly, the combination of fungi and a moist environment can speed up the fungus growth. Individuals with a weak immune system, such as diabetic patients and elderly people, are more susceptible to toenail fungus. You can read here about Toenail Fungus Laser Treatment. Nail fungus infection results in thick and yellow toenails, but may also cause other more serious complications. Toenail fungus can cause foot pain. The foot pain usually gets worse when the infection spreads from one infected nail to the other. Another embarrassing symptom of toenail fungus is bad foot odor resulting from fungi debris under the nail. In addition, fungus sheds from the nail and spreads all over your house. This fungus shedding can cause toenail infections to other members of your household. Therefore, the biggest danger is hurting the people you love. For these reasons we recommend starting toenail fungus treatment as soon as possible. Our podiatrists diagnose and cure thousands of nail fungus patients every year. Contact us to learn about our toenail fungus treatment and how our doctors can help you get healthy, clear, fungus-free nails. Getting rid of toenail fungus will give you the confidence to expose your feet again. Our clinics offer unmatched expertise curing toenail fungus, since our nail doctors focus exclusively on toenail fungus removal. We proudly serve Los Angeles, New York City, Dallas, Boston, and over 40 other major cities. The toenail doctors of Laser Nail Therapy offer state-of-the-art toenail fungus laser treatment, combined with first rate patient care. Most of our locations are open 7 days a week from 9am to 9pm. Pinpointe Foot Laser toenail fungus treatment is a real breakthrough, bringing new hope to millions of patients suffering from this problem. Our experienced foot doctors have successfully treated tens of thousands of patients with toenail fungus, in over 50 locations across the U.S. and Canada. 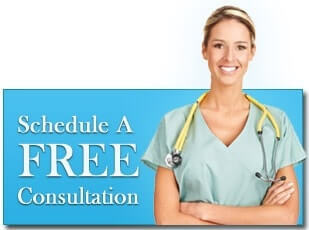 Contact us if you would like to hear how our doctors can help treat your toenail fungus. Click here to learn more about Nail Fungus Treatment Options. Nail fungus (Onychomycosis) is a fungal infection of the nail and nail bed. This should be differentiated from athlete’s foot or skin fungus in which the fungus infects the skin on the feet especially between the toes. About half of the nail disorders and nail abnormalities occur as a result of the fungal infection process. Therefore, the infection is much more prevalent under sick or deformed toenails. Nail infection is usually very persistent and the treatment is complicated. In addition, Toenail Fungus and Fingernail Fungus Infections may cause embarrassment because of the deformed and ugly nails. Toenail Fungus signs include a thickened nail plate or nail bed, yellow discoloration of the nails, foot pain and bad foot odor caused by the fungal debris under the nail. The nails often become thick and fragile and can detach from the nail bed or the skin under the nail. Nail fungus infection causes your nails to look ugly, thick and yellow, but can also cause other more serious complications. Toenail fungus can cause foot pain. The foot pain usually gets worse when the infection spreads from one infected nail to the other. Another embarrassing symptom of toenail fungus is bad foot odor resulting from fungi debris under the nail. In addition, fungus sheds from the nail and spreads all over your house. This fungus shedding can cause toenail infections to other members of your household. Therefore, the biggest danger is hurting the people you love. For these reasons, we recommend starting toenail fungus treatment as soon as possible. Our podiatrists diagnose and cure thousands of nail fungus patients every year. Contact us to learn about our toenail fungus treatment and how our doctors can help you get healthy, clear, fungus-free nails.